This beautiful Victorian cottage is located in the most sought after area in the Thousand Island Region, Thousand Island Park. This is a private community hosting lots of activities for children. This is not a stripped out rental cottage, but a beautifully furnished cottage with lots of character. Our family has owned this cottage since the property was bought in 1875. Originally there was only a tent platform. In 1883 the cottage you see in the pictures was built. This has been in our family for almost 140 years! It is beautifully furnished and has all of the amenities to ensure you and your family have a wonderful stay in TI Park. You will not find a nicer cottage to rent in Thousand Island Park. And definitely will not find one with the level of Victorian Era Charm that our cottage offers. Take a step back in the past and visit the Thousand Islands! Huge gourmet kitchen. Includes everything an avid cook could want... even an extensive collection of spices! You can squeeze 10 in at the table, but it is a little tight! Rentals available at the community main dock. You are welcome to use our bicycle built for two. Rentals available in nearby Alexandria Bay and Clayton as well. You can purchase a pass from the corporation office to use the tennis courts during your stay. There are three golf courses on Wellesly Island and many several more across the bridge on the mainland. The fist floor of the cottage is accessible. Large lot, Smoking not allowed in the cottage or on the porches! No candles are allowed as well. If you want to rent a golf cart during your stay, call Red Castello at 315-439-2519. He can accommodate your needs. If you need a boat slip during your stay, call Any Hill at 321-213-5811. The Attwell Wild Cottage in TI Park is one of the true historical "cottages" and is in amazingly solid condition. It's been expanded since the 1930's and has four bedrooms, two and half baths, and the best sleeping porch ever. We loved sleeping outside completely screened in. The house has an ample kitchen, terrific great room with windows galore, a living room, a parlor a porch large enough for ten or more (and eating outside) and an intimate side porch for a quiet place to read away from others. My boys really appreciated that they could sit together or have their own spaces. And we all loved the "bar" set up for breakfast. Its on a quiet street but close to the water, tennis courts and Wesley Inn and Guzzle restaurant, Library, Pavilion and has its own parking and even a bike rack and grill. Lots of towels and clean sheets. TI Park is made for bike riding and walking; you can rent a golf cart too. You need a car only to arrive and to go off island exploring or get to the nature center, state park or golf courses. We loved this house and its location and look forward to staying there again. Ken and his caretaker made sure we were settled in and were very accommodating. Thank you! We just returned home after a week at Atwell-Wild Cottage and enjoyed it very much. The cottage comfortably accommodated our party of nine, including grandparents, siblings, spouses, and kids. Well-equipped kitchen, lounging and dining areas, plus plenty of nooks for quiet reading or napping, both outdoors and inside. Amenities as listed, convenient walking distance to the TIP library, playground, and activities. Our biggest challenge was the hot weather; even with ceiling fans, we needed a few extra fans to cool the upstairs bedrooms at night. The owner was responsive to all questions and issues, before and during our stay. Would highly recommend this property, especially for extended family groups. As I write this, we are preparing to leave the cottage after a wonderful week. The cottage was cozy and clean, with VERY interesting books and memorabilia. The beds are comfortable, and the kitchen and dining area very accessible for our extended family group. I would LOVE to return. The cottage's location near the Guzzle and playground and library is ideal for famiies with young children. The owner was very accommodating and answered all questions promptly. My family has been going to TIP for over 100 years. Now that we don't have our own cottage in the park, we have rented a different one for the past 4 years. This one was very comfortable. We had 2 grandparents, younger couples, one teenager and two toddlers. Plenty of seating for dining. Nice, modern kitchen. Bedroom on 1st floor provided ease and privacy for the grandparents. It was nice to have 2 full baths (one on each floor). The beds were comfortable enough - which is a HUGE plus in TIP, as many of the beds are as old (100+) as the cottages. It was nice to have the use of the golf cart and the grill. We even took the tandem bike out for a spin. We loved all the books and photos they had throughout the house. Oh, and the smart TV was a big hit. If we have the same number of people next year - we would stay here again. 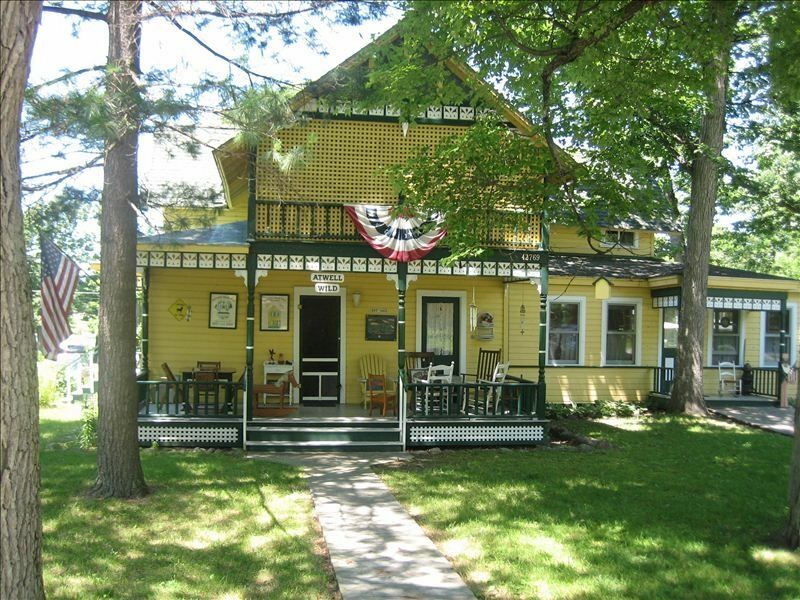 This was the perfect place for our family to stay in Thousand Islands Park! The large dining table and dining area was perfect for the six of us. Because the kitchen was so wonderful, we were able to prepare and eat most meals together - and it was so clean when we arrived, too! The first floor bedroom was good for my chronically ill husband but my mom (she is ninety-one) had a hard time with the narrow staircase. We loved the spacious second floor, though. After our short trips to Boldt Castle and Kingston we had fun watching our photo-slideshows on the new smart tv - what a treat. My husband and I are history buffs so we spent free time reading the walls - the family history there is fascinating. My brother loves antique boat motors and there was actually one on display in his room. All in all, the house and the surrounding community were just a wonderful experience. Everyone we met was kind and friendly. The whole family hopes to return next year. Oh, and thanks for the perfect weather!! The Atwell Cottage in TIP was the perfect place for us to enjoy a vacation in a truly special part of the 1000 Islands. The family photos and memorabilia made the cottage feel like home, and were a great window to this unique community that began as a church camp during the Chautauqua movement. The recent renovations were well done and the cottage is clean and well furnished. The owner and property manager were responsive and helpful. We hope your stay as much as we did.